Place Amazon's Kindle Touch and Kindle Fire side by side. Which display looks more dynamic and compelling? The answer, of course, is obvious--which may explain why consumers, when given the choice between conventional (i.e. drab) eReaders with e-ink displays, and splashier color tablets, are opting for the latter in a big way. Global shipments of e-readers will reach two million units in the first quarter of 2012--down dramatically from nine million shipped in Q4 2011, according to new data from Digitimes Research. It appears that color tablets, including the Kindle Fire and Barnes & Noble's Nook Tablet and Nook Color, are luring eReader customers away from less expensive, less flashy e-ink models. Digitimes Research calls the phenomenon a "substitution effect," one that has forced Amazon to reduce orders of e-ink eReaders from its suppliers thus far in 2012. The big-picture view of the eReader market isn't dire, however. 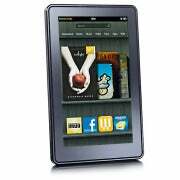 Global shipments of eReaders climbed to 22.82 million units in 2011--up 107 percent from a year earlier. And annual eReader shipments should exceed 60 million units by 2015, Digitimes Research estimates. Declining consumer interest in monochrome e-ink displays may explain another recent rumor--that Amazon will soon unveiled a Kindle eReader with a 6-inch, color e-ink display. Barnes & Noble may have similar plans, says IDC display analyst Bob O'Donnell. The price gap between LCD and e-ink displays is narrowing, but "LCD is still significantly better for color reproduction," says O'Donnell, who adds that the ideal display might be a hybrid, switchable LCD/e-ink model: color LCD for tablet-oriented tasks like games and video; and monochrome e-ink for reading. "That would be interesting," says O'Donnell.